Five days of inspiration, discovering new trends and meeting creative people - this year’s Maison & Objet was a wonderful experience. 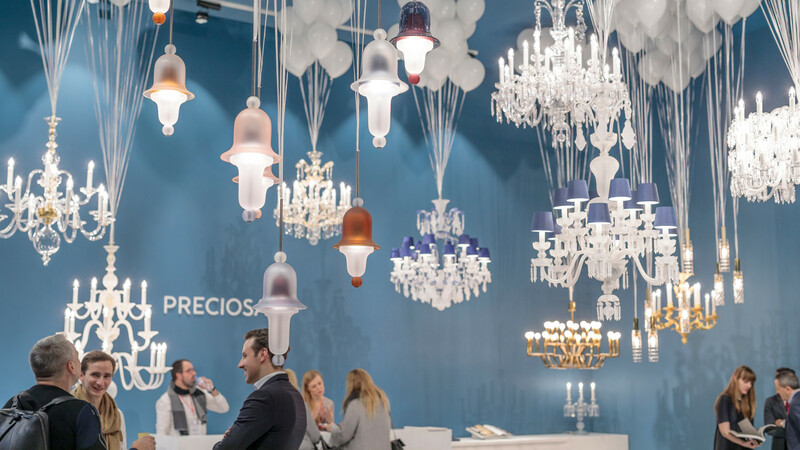 Our team not only had the opportunity to showcase some of our favourite chandeliers, we also took time to explore much of what the fair has to offer. We were especially impressed with the brands in Halls 7 & 8. Hall 7 was the place to discover emerging brands, while Hall 8 was home to more established ones. Beautiful presentations could be found in both and our trendwatching eyes were wide open. Our team noticed a lot of colours, bold ones in particular, and the use of colour blocking. Even though the idea of ‘maximilism’ is popping up now and again in design quarters, minimalist looks still dominated many of the stands. Textiles were all around, especially those incorporating velvet and fringe. We also discovered arches and curves in design details plus plenty of greenery freshening up many spaces. We were also interested to see the continuing trend of fashion brands establishing a lifestyle mark. As we’ve been discussing recently, lights are being used to create atmosphere in a room, and we found other statement pieces also seeming to act like interior jewellry. Perfect elements for putting your own stamp on a room. Every year, the home and lifestyle show allows people and brands to connect; sharing ideas, energy, and new perspectives. This year, Preciosa Lighting introduced a new Solitaire to its Collection, Siren, spread the news about our flagship store in Prague, and announced our growing network of retail partners. We are dedicated to connecting with individuals the world over who are looking for a statement lighting piece. We returned from Paris energized by the new designs we discovered and people we met. We are more motivated than ever to continue our journey to send light to the world.